Windows Live Photo Gallery with its Share group right on the Home Ribbon makes sharing pictures with friends and the world very straightforward. Just select the photos, click the sharing service, a couple more selections and the images are on their way to the web. Here are the icons as they show on my Photo Gallery. I share to Windows Live Groups, SkyDrive, Flickr, Picasa Web Albums, and Facebook. You may have other services added to your Share menu. Pictures are most useful when the people pictured in them are identified and the photo location added along with other tags to help in finding them. Photo Gallery makes it so quick and effortless to add and manage such data. It is very easy to forget to remove any information in the metadata that should not go out on the Internet. 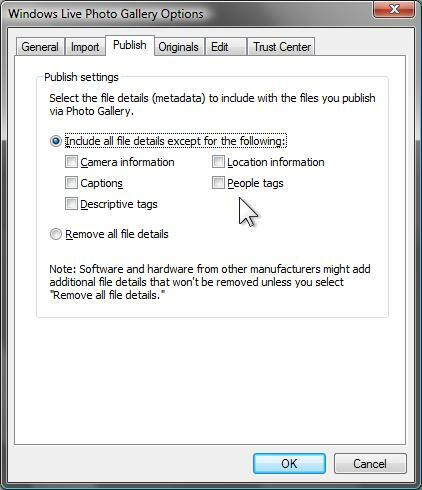 So it is best to set up the Photo Gallery Options to remove sensitive data from photos before they are sent out. Click the File menu button (upper left). By default, as shown here, “Include all file details except…” is selected with nothing excluded. Click the details to be removed. Camera information, Captions, and Descriptive tags may be useful to viewers and harmless to share. However, it may be undesirable to share Location information and People tags. Such information could be misused by malevolent folks. There may be other information stored in the photo file that was added by means other than Photo Gallery. Such information will still be retained in the file that is uploaded. For example, I have my camera set to write a Comment into the EXIF data. I also use Windows Explorer to add my name in the Authors field and a copyright notice. Such information is only removed when the Photo Gallery option “Remove all file details” is enabled. Set the options to your preferences, Photo Gallery will retain the setting. When next you do a quick upload you know only the data you wish to go out on the Internet will be published. This entry was posted in Photo Gallery and tagged digital imaging, EXIF data, metadata, Photo Gallery, Photography, photos, removing metadata, SkyDrive, Windows Explorer, Windows Live. Good post Ludwig! I could do with you commenting on my Live Photo Gallery post and telling those who are giving me a very hard time in comments how to do this. I’ll point them to this blog. Okay? In Flickr the metadata, including tags, that was assigned before upload will not show, although it is there in the photo files. There is a site, “fluidr” which shows your Flickr photos along with all the metadata. In your Flickr web address just replace the “ick” (in “flickr”) with “uid”, so it looks like “fluidr.com/photos/yourname”. Click on the data line next to a photo, you will be surprised.